These are two recipes that I put together to make one meal. The potato recipe comes from the book “365 Dish a Day: A recipe for each of the 365 days in a year” and the chicken recipe I found in my recipe box so I’m not sure where it came from. Most likely from the internet somewhere. I forgot to take pictures of them after they were ready to go, but here are a couple pictures of them while they were cooking. Cook the potatoes in a pan (I used a pot) of boiling water for 10 min. then drain thoroughly. Pour a little oil into a shallow roasting pan to coat the base. Heat the oil in a preheated oven, 400F, for 10 minutes. Add the potatoes to the pan and brush them with the hot oil. In a small bowl, mix together the chili powder, caraway seeds, and salt (I accidentally also added the basil which turned out fine). Sprinkle the mix over the potatos, turning to coat them all over. Add the remaining oil to the pan and roast in the oven for about 15 mins, or until potatoes are cooked through. 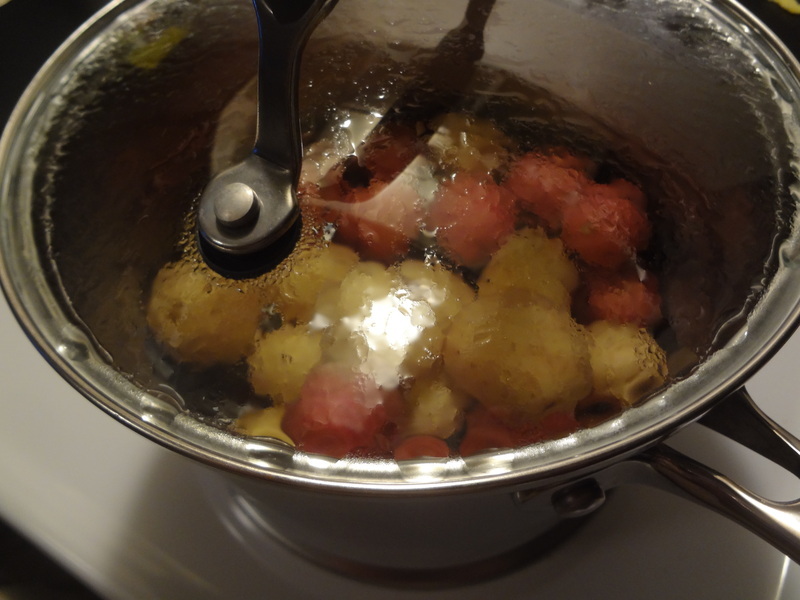 Using a slotted spoon, remove potatoes from oil, drain well, and transfer to a serving dish. Sprinkle basil over the top and serve immediately. Whisk egg with salt, pepper, and garlic in a small bowl. In another bowl, mix the cornstarch and flour. 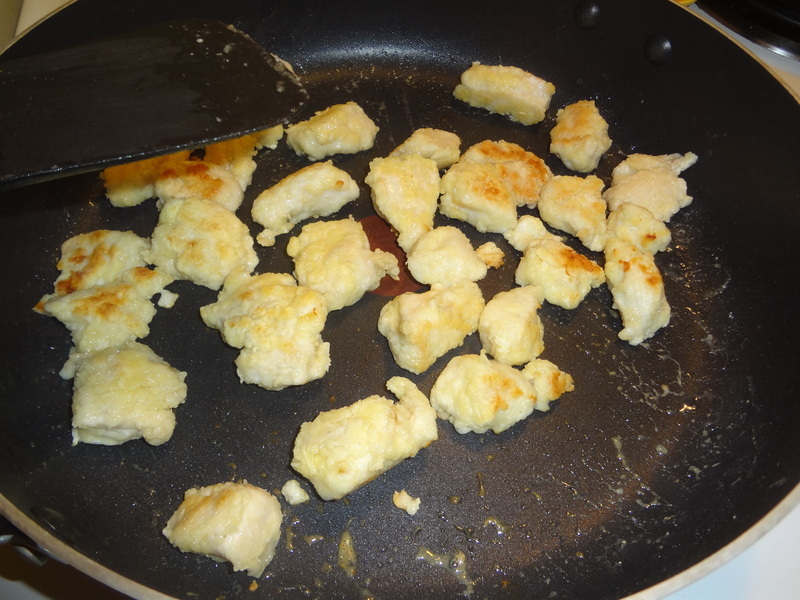 Dip the chicken in the egg mixture and then into the dry mixture. Over med-high heat, pan fry chicken in oil. Once cooked, let rest on paper town on a plate. After cooling and draining, toss in sauce (I just put sauce on our plates so we could choose how much we wanted on our chicken). 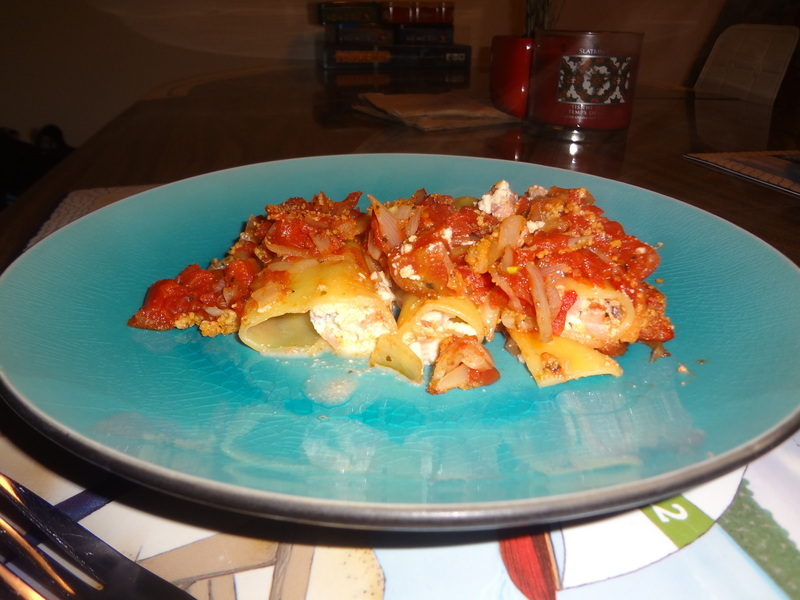 This was the first time I’ve ever made Cannelloni before. I found this recipe in the book “365 Dish a Day: A recipe for each of the 365 days in a year” and it sounded easy enough. The noodles I bought said they were oven ready and did not need to be boiled, so I skipped that step. Because the noodles were still hard, when I poured the sauce over them I heard some of them crack which resulted in some of the noodles being split open once they cooked. But they still tasted good so it wasn’t a disaster. There was also a note saying that you could substitute Parmesan Cheese instead of the Pecorino cheese, and since I had no idea what kind of cheese that was, that is what I did. But I don’t really like Parmesan cheese so I will either find the mystery cheese next time, or just go without. As for the ham, I might try cutting it into strips instead of dicing it because you couldn’t really taste much ham. Preheat oven to 350F. Heat the oil in large heavy-bottom skillet. Add onions and garlic and cook over low heat, stirring occasionally, for 5 minutes, or until onion is softened. Add basil, tomatoes with their juices, and tomato paste. Season to taste with salt and pepper. Reduce heat and let simmer for 30 mins, or until thickened. Meanwhile, bring a large heavy-bottom pan of lightly salted water to a boil. Add cannelloni tubes, return to boil, and cook 8-10 minutes, or until tender but still firm to the bite. Use a slotted spoon, transfer to a large plate and pat dry with paper towels. Grease a large, shallow ovenproof dish with butter. 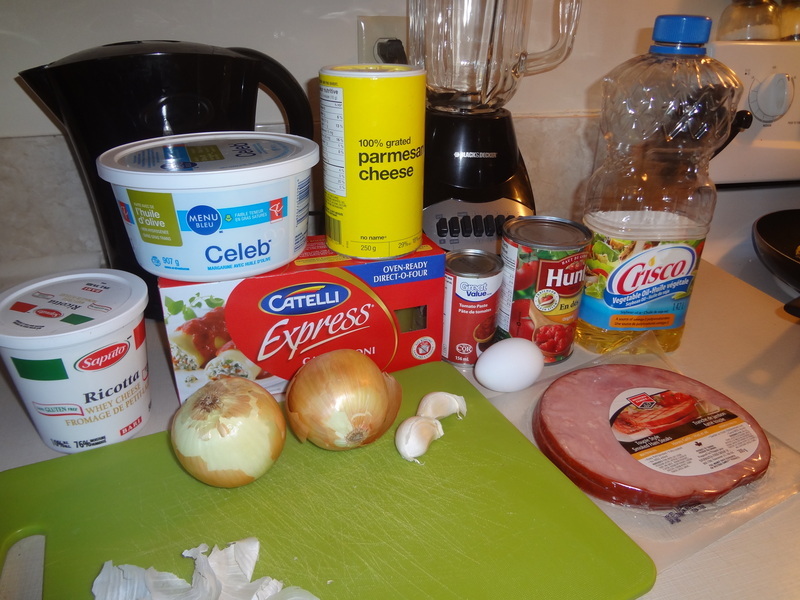 Mix the ricotta, ham, and egg together in a bowl and season to taste with salt and pepper. 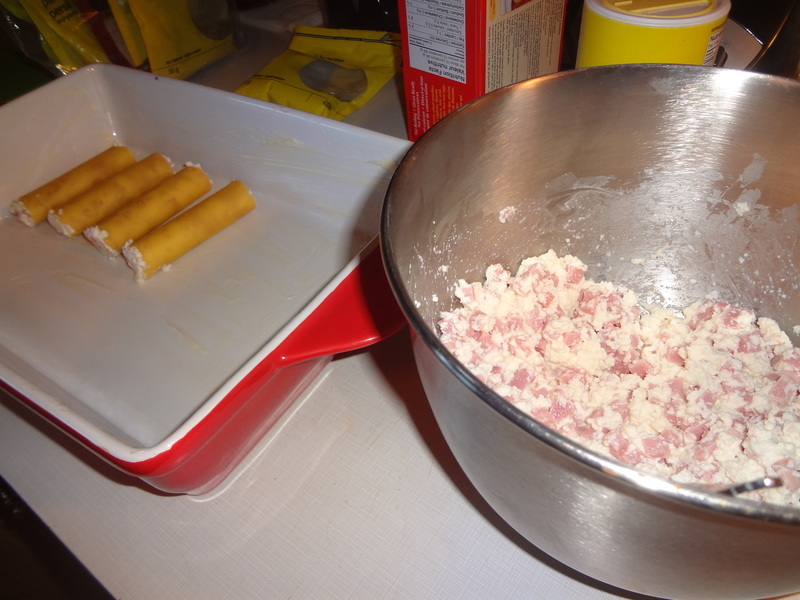 Using a teaspoon, fill the cannelloni tubes with the mixture and place in a single layer in the dish. Pour the tomato sauce over the cannelloni and sprinkle with pecorino cheese. Bake in the preheated oven for 30 minutes, or until golden. Serve immediately.